The Gabon forward was a late withdrawal ahead of tonight’s Champions League game against Sporting CP. which the Bundesliga side won 1-0. PIERRE-EMERICK AUBAMEYANG was dropped from Borussia Dortmund’s squad but Thomas Tuchel’s side secured progression from Champions League Group F regardless with a 1-0 victory over Sporting CP. Dortmund’s top scorer Aubameyang had been set to start the clash at Signal Iduna Park but, in a late alteration, the 27-year-old was replaced by Adrian Ramos. Tuchel cited “internal reasons” as the only explanation for Aubameyang’s suspension, but the forward was not missed as Ramos gave Dortmund the advantage early on. Ramos’ header — his first Champions League goal of the season — set the tone for a frantic first half and Jorge Jesus’ side pressed hard for a leveller before the impressive Christian Pulisic hit the woodwork. To Tuchel’s annoyance, Dortmund invited the pressure in the second half and the hosts would have been punished had Bryan Ruiz not squandered a gilt-edged chance late on. The victory moves Dortmund to the top of Group F and seals their qualification for the knockout stages. Sporting, meanwhile, are all-but eliminated, though Real Madrid’s draw at Legia Warsaw handed them a lifeline. 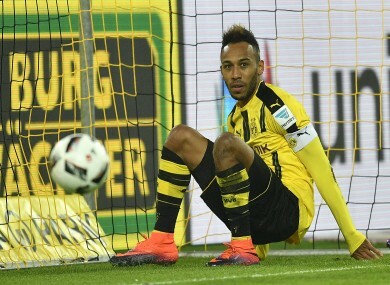 Email “Dortmund suspend star striker Aubameyang just before kick-off over 'internal' issue”. Feedback on “Dortmund suspend star striker Aubameyang just before kick-off over 'internal' issue”.